HPNA association (or HomePNA) was founded in June 1998 by 11 companies: 3Com, AMD, AT&T Wireless, Broadcom, Compaq, Conexant, Hewlett-Packard Co., IBM, Intel, Lucent Technologies and Tut Systems (today there are more than 150 companies). Their goal was creation of a technology for organizing a local network with telephone cables in apartment houses. The first products provided a speed of 1Mbit/sec on one pair of cables with any network topology at the maximum diameter of 305 m. One segment could contain up to 25 stations. The HPNA products are easy to use, if you have at home a phone jack: you have just to connect an HPNA card to it. If necessary, you can insert a telephone set's connector into the second connector of the card (or fax, modem etc.). The HPNA networks do not affect telephone communication at all. Apart from network cards, there are HPNA-Ethernet bridges and many other universal devices (print-servers, routers etc.). The list of some of them can be found here. In September 2000 HomePNA offered the second version of the specification thus increasing the operational speed up to 10Mbit/sec. Being back compatible with the HPNA 1.0 it ensured a speed of operation at the level of 10-Mbit Ethernet networks. One of the manufacturers who offer a full range of HPNA 2.0 equipment is Linksys, an american company. Today we will review its network HPNA 2.0 cards HPN200 and Bridger-Router HPRO200. The company also offers cards for USB and PCMCIA buses and an Ethernet-HPNA bridge without router's functions. One of major parameters of such consumer equipment is simplicity of installation and adjustment. The first test was conducted to find out how fast the HPRO200 can be installed and prepared for operation. It is a bit subjective test because it greatly depends on the experience. Before installation we gathered information about the network settings and read half of the Manual. Installation of the HPN200 was easier than expected. The matter is that our operating system Windows ME had drives for Broadcom based HPNA cards. That is why we didn't even need a CDROM disc with drivers. 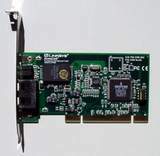 The card was connected to the HPRO200 with a 3-meter telephone cable. The second computer (with a usual network card) was connected via a usual 10Mbit hub to the LAN port of the router. As it turned out, the HPRO200 could successfully replace Linux. I connected the HPRO200 to the hub of a local 10Mbit network, and the WAN port to the Internet socket. After that I had to change several settings of the router (as well as the MAC address of the WAN port), after that everything worked perfectly! To estimate the speed of operation of the packet commutation device I used the program for reading of a network disc. The stable reading speed was 550 KBytes/sec for the Linksys and 460 KBytes/sec for the Linux based router. For the tests I used not a separate HPN200 card but a set of two such adapters. The HPN200SK set consists of 2 HPN200 cards, 2 standard telephone cables, description, a registration card (with a 5-year warranty), a CD with drivers and the Internet LanBridge program from Virtual Motion, Inc. The 36-page description contains detailed installation instruction for the adapter in the Windows 95/98 or Windows NT based PC. In the description you can also find a section of solving frequently occurred problems. The HPN200 card for PCI 2.2 bus has one large chip and three smaller ones, 4 LEDs and two RJ11 connectors. The Broadcom chip is almost a single solution for the HPNA 2.0. Broadcom has already developed a next generation chip working at 32Mbit/sec. The LEDs correspond to "Link", "Transmit", "Receive" and "Collision" states. Two RJ11 connectors are intended for simultaneous connection of a telephone. The drivers ship for the following systems: Windows 95/OSR2, Windows 98/98SE, Windows NT 4.0 SP4, Windows 2000. As I have already written, first we installed the system under the Windows ME which, as it turned out, contained drivers for the HPNA 2.0 cards on the Broadcom BCM4210KTF. They suited excellently the Linksys HPN200 as well. The system was installed with the ACPI support and the Linksys card worked flawlessly on one interrupt with the 3Com network card. After that turned to the Windows 2000 Pro based PC. The drivers were easily installed, and the Control panel received an icon from Linksys. This program helps to check the status of the card and of internal meters and to carry out diagnostics. The adapter was checked also in the Windows 98. First the card refused to work, but the problem was solved after re-insertion into another PCI slot. It should be noted, however, that the Windows 98 based PC was overloaded with cards (sound, SCSI, network), programs and old drivers, that is why this problem mustn't be taken as serious. Unfortunately, since Broadcom hasn't released the official specification of its HPNA 2.0 chip, drivers for Linux are absent at present, and the program support is provided only for the Microsoft Windows family. But at the same time there are drivers for many versions of Linux for HPNA 1.0 cards (for example, for those based on AMD chips). The complete set of the HPRO200 includes a router, a power supply unit, one telephone cable (with RJ11 connectors), description and a CD with installation instructions (4 video clips) and technical documentation. The device itself measures 19 X 16 X 5 cm. A 5V external pulse unit is used to power the device. On the front panel you can find the following indicators: power supply, 3 for LAN (Link/Act, Col, 100), 3 for WAN (Link, Act, Diag) and 3 for HPNA (Link, Act, Col). All cables are to be brought to the rear side. There you can find a power supply connector, a reset button, two network connectors RJ45 - for connection to LAN(10/100BaseTX) and to WAN (10BaseT). The LAN port is equipped with a switch to be used as an Uplink port. Besides, on the rear panel there are three RJ11 connectors for a telephone network. One, equipped with a microfilter, is intended for connection of a telephone set, two other are meant for HPNA segments. The reset button, when pressed and held, is used for setting the device into the initial state. When just pressed and released, it is used for breaking the current connection of the router. The device implements two functions. The first one is a bridge between HPNA and Ethernet networks. Here you must take into account that in the HPRO200 the DHCP server is set at default, and it can clash with a server in the network. The second function is a router. The HPRO200 has a WAN port of the Ethernet standard. Such variant of connection is usually used by cable modems, but you can also simply connect to the 10BaseT network. That is why it can serve also as a router with two Ethernet ports. Setup Installation of basic parameters: host name, domain name, LAN IP address, WAN IP address, a router's address at default, three fields for addresses of DNS servers, PPPoE and username/password for it. DHCP enable/disable DHCP server, assign a start address and the number of dedicated addresses; look though the table of distributed IP addresses. Log assign an IP address of a PC (only in LAN) for sending messages about sessions; look through a list of income/outgoing sessions. Help a detailed description of menu items in HTML format. The "Help" button is located on each page of settings. Dynamic Routing activation of the gateway mode of the device (NAT is on) or Router (NAT is off); establishment of direction of data on routing between routers; look-through the routing table. Static Routing establishment of up to 20 static routers. The set of functions and settings is defined by the firmware version of the device. It can be changed, if necessary, by downloading a new one from the Linksys' site and loading it into the router. Unfortunately, these lists do not reflect the number of received or sent bytes. I don't think this is a baffling problem. Such variant will only improve the functionality of the device. The only thing that bothers me is rebooting of the device when some parameter is changed (HPNA adapters are disconnected from the network). It is possible that it is caused by simplicity of the software (it takes only 500Kb). I wish there had been such item as fast saving and recovering of configuration from a file. The official parameters of the HPNA 2.0 define the data rate of 10Mbit/sec on 300m networks. Unlike the Ethernet, for the HPNA 2.0 technology the speed of operation depends on a length and quality of the communication line. You can reach 300 m at the expense of speed. We connected two PCs with HPN200 cards with a 5m telephone cable. The data rate was 8.4Mbit/sec against 8.5Mbit/sec for the 10BaseT network between the same PCs. The tests were carried out with the LANEVAL program, which uses the TCP/IP protocol for measuring the data rate between two PCs establishing the TCP connection and transferring packets of the specified length. In the second test we used the HPRO200. The speed was 4.7Mbit/sec. The computers were connected with a 300 m long thin coaxial cable (RG58). The speed was almost the same as in case of a 5m cable. After that we connected all cables to get a 600 m long cable. The cards worked perfectly lowering their speed just a little. The data rate didn't depend on whether the HPNA segment is a part of the telephone cables. Besides, it is not necessary to have the line live. The next test was conducted in two offices located at the distance of 250 m from each other. The offices were connected with a thick multiconductor cable. With the HPRO200 and the HPN200 card the connection was established on one free pair. After that the card was replaced with the HPRO200. If you use exactly the HPRO200 only as a bridge between Ethernet and HPNA networks, then, apart from disabling the DHCP server, it is desired you set some IP address for the WAN port of the device to provide a more reliable operation of the device (without it we had difficulties when accessing an administration page). Our experiments didn't affect either telephone talks or modem connection. An incoming call and further telephone talk didn't affected the quality of operation of the HPNA equipment either. As for the reliability, it must be noted that closing of the cables in the pair made the data rate drop almost twice, and in 10 seconds the connection was lost completely. When one of the cables of the pair was broken, the connection wasn't lost: only the speed dropped twice. The HPNA technology has wide possibilities, is undemanding for the medium of communication and high reliable. The realization of the HPNA from Linksys showed that the standards can be not only maintained but also exceeded. Of course, it is possible thanks to the Broadcom chip. As for the prices, they are constantly falling down, and today a solution for joining two Ethernet networks at the distance of 300 m with one pair of cables costs less then $500.